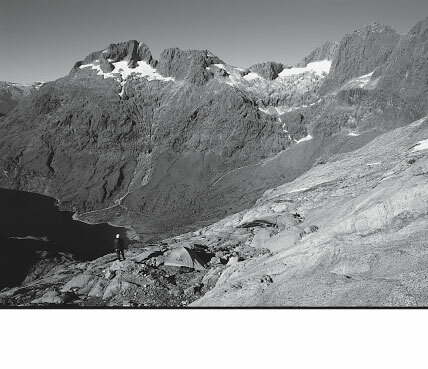 The col north of Adelaide gives a route to the Gunn Basin and the now overgrown track down to the Hollyford Valley. An easy route up the ridge. Gerry Hall-Jones, Rod Ryan, Bryce Wood, Dec 1953. A line up the middle of the face trending right to exit fairly close to the summit on the Adelaide Sabre Col side. Crux on the first pitch. 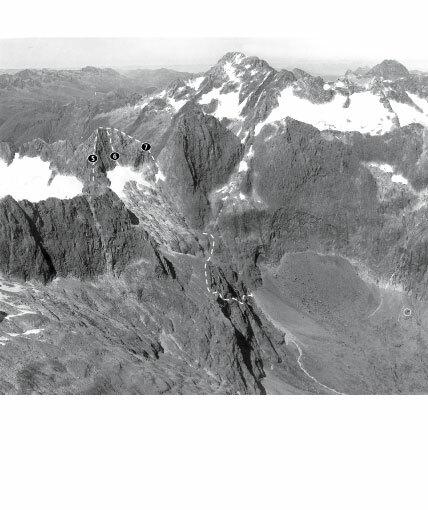 The party descended the ridge to the Adelaide Sabre Col.
Hugh Logan, Ian Whitehouse, 1975. Jim Milne, Richard Stewart, A M Greet, Jan 1959.